For Unto Us in a BIG print! I love it so much, but wanted to make it REALLY big in my house. I had it printed 3 feet by 4 feet by a local printing company for a great deal. I had it mounted on a PVC foam board called Sintra and hung it with Command velcro strips. I love how it turned out! I kind of love looking at my home in black and white…so magical! I’ve had a lot of people ask how they can purchase this print. 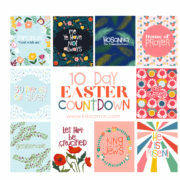 To order an 11×14 digital print, order the Scripture or Mix Countdown HERE. To order a 16×20 digital print click HERE. To order a 36×48 digital print click HERE. The 11×14 comes in both a png and pdf format, the larger sizes come only in pdf format. The chalk version in the big size is a lot less “chalky” due to pixalation occuring. 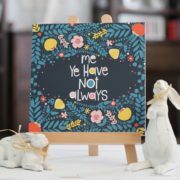 I have the chalk version hanging and love it, but there is also a plain black version available! All digital files will be sent within 24 hours..many times MUCH sooner! You can also buy a few new prints I have been adding to my digital shop as well! How is your Christmas Decorating coming along? This is probably a silly question, but if I buy the large version and decide I want it smaller can i print it smaller and have the resolution still be good? I wanted to purchase the 36 x 48 option but I do not see it in your shop. Where can I get it? Are your print prices ($6 for 3′ x 4′) for a digital file only, or is that for the ACTUAL print mailed to us? Is it mounted or unmounted? Hi Mikki..this is for the digital file. You will be emialed the file within 24 hours(usually much sooner) and then you print it wherever you would like!) thanks! What size do you need it for Rachelle? email me at kikicreates@gmail.com Thanks! Hey, quick question…when you order these from say Costco to you get them in luster or gloss? 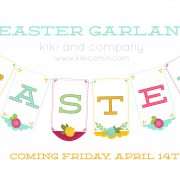 Pingback: Win $50 to Kiki and Company’s Digital Shop! Quick question – did the same place that printed it for you mount it? Kinkos can print it but it will cost about $100.00 to mount it!? How do you “mount” it to the sintra? And where do you purchase that? Love this. Is the one you have on your picture the chalk effect? Will have to get this for next year. I love this print, however, counselor is only spelled with one L. Would you consider fixing this so I can order it? Thanks!! 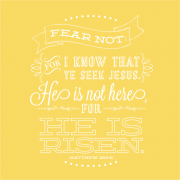 Pinned this yesterday….It is beautiful! Hi, can you tell us what you had to get it printed in 36×48? I cannot find it for less than $79, just want to know if this is normal or if I can find it cheaper? Here is my cost breakdown, although I haven’t done it yet. It is on the list for the week! Now, mine won’t be on canvas, but it is a savings that I can live with. A 3 ft x 4 ft canvas is crazy expensive. Even just the roll canvas is expensive and then you have to mount it. Hi, I saw what Karen M. said she was going to do. My staples charges $7.29 for a 36 x 48 engineering print. Is an engineering print (which is only usually line drawing) going to work for this. It says this will not work for photos. What kind of printing did you use? I can’t afford to do multiples if it doesn’t turn out right. Thank you. hi deborah, the file you have is a vector based pdf, not a photo format, so it should work just fine. I have had readers write and say they got it done at staples and it worked just great. Hope that helps! thanks! Thanks for the fast reply. I just called a local printer and they said it would be $66 to print and $33 dollars to mount it. Not sure if that is a good deal or not. Should I be looking around or does that sound about right? My budget won’t allow for that this year, so I will go with staples for now. I could always get it redone in the future if I’m not thrilled with it. Thanks again. This is beautiful. I have a huge mantel and this will definitely make a statement. Oh, and in response to a question further up. You can order the large file and it will shrink down fine. Sometimes you can use a smaller file and blow it up, but it depends on the program it was made in. If it was made with vectors, it will enlarge nicely. If it wasn’t, there can be some distortion of the pixels. I’m not smart when it comes to this but I WANT ONE! So if you don’t mind clarifying what I need to do after ordering it. You email me the digital file and then what do I need to do to have it printed at Kinko’s or where ever? Ah spray adhesive…good thinking!! Modge podging it only caused my foam board to curd and the paper to “wrinkle”. Will have to find a printer and someone to mount it for next year and make due with this one this year. I took the file into Staples and asked him to try the 36×48 print. The edges were a bit faded, but nothing serious. I also had him make a 24×36 for kicks. The fading wasn’t as bad on the edges, but it was too small!!! I ended up with the 36×48. Over to Home Depot for my foam board and spray adhesive. We came home and I cut the foam to be smaller than the print. That way I was able to fold the fading edges around the edge of the foam and it isn’t noticeable. I had plenty of extra room on the print to do this. I attached with spray adhesive and then put a light coat of Mod Podge Paper Matte on the top. It is currently drying on the kitchen table. I will leave pots and pans on it over night so that it doesn’t curl up on me at all. I had priced out both Canvas and Enlarged Photo Prints here. Everyone was well over $50 for just the print, no mounting included. Hi Karen M. If that is your photo on the web page, I love it. It looks so good. I see that you said you had it printed as a 24 x 36 inch, was that from your 36 x 48 pdf file. Was this also done as an engineering print? You said it was too small. Did you just mean for what you needed it for or did it make the words too small. Thank you for your help. I just found you through Whipperberry, and I’m so glad I did! I really LOVE thisi print and just ordered the 16×20. 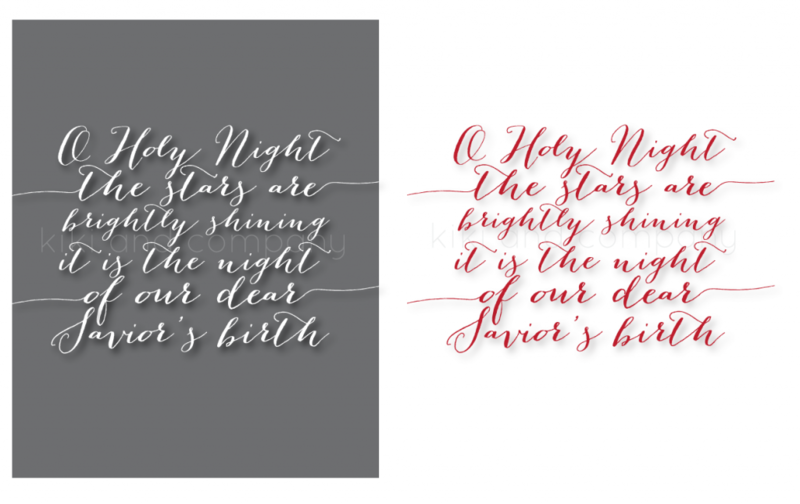 I really like the fonts used, and the flourishes – just the whole thing is beautiful! 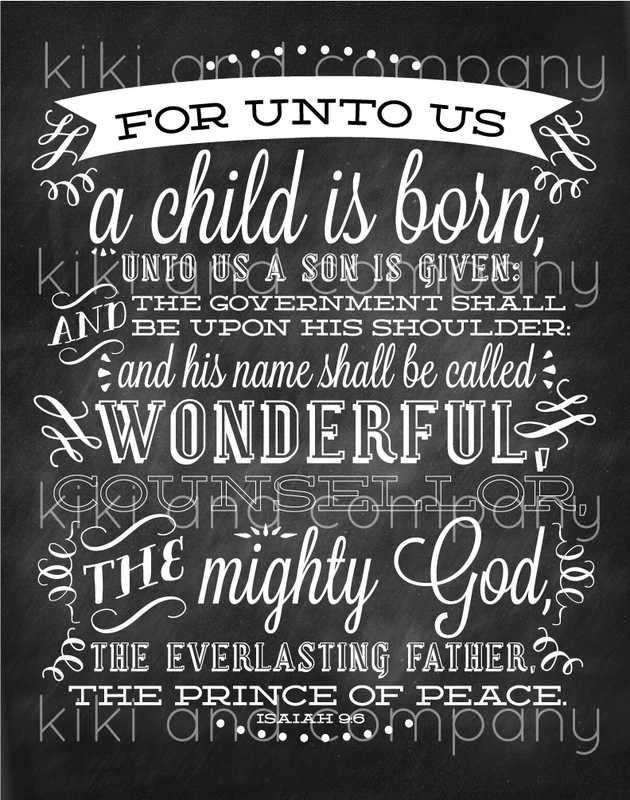 It will be a beautiful reminder of the meaning of Christmas, and I’m thinking it will also hang in our bedroom throughout the rest of the year. Thanks so much for sharing your talent! waiting. excited. thanks. a. lot. I have a question, Could you e-mail me? Thanks. Hi, I sent a previous comment before reading ALL the comments. 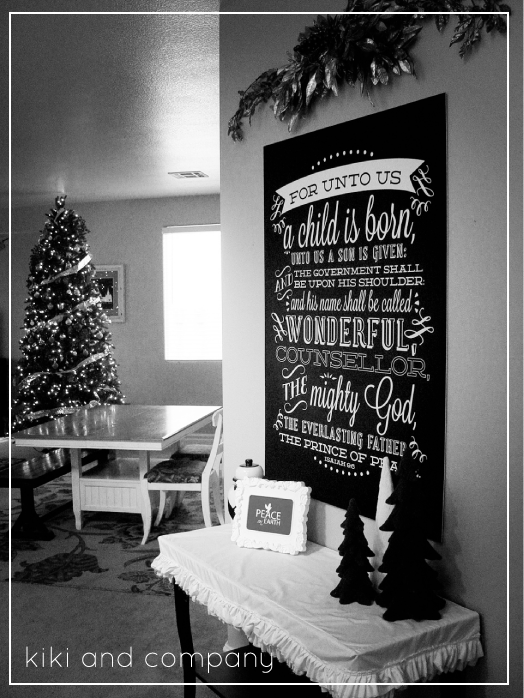 I see that you offer the chalkboard look in a 36×48 but that is a little too big for my mantle. I was wondering if I could get it in a 34×40 size? Or if I purchase the 36×48 and have it printed in the size I need, will it be distorted? I’ll be awaiting your response. Thanks!! This is one of my favorite scriptures, I love it. Whenever I read it, I get goose bumps, or choked up, or both. Thanks for this, I’ve gone on faith and ordered the 3×4, lol. I will see about the printing and mounting, but I am qualified with spray adhesive in a pinch. I went to your link for your printer but I could not decipher the site, duh me most likely. God Bless you and Merry Christmas! oooh, perfect, kellie. i can’t wait to hear! :) thanks. Pingback: Christmas is a coming! This is beautiful! I love how large you did it on your wall. I’m trying to think if the hubster and I have a wall space open enough for this in our apartment…. 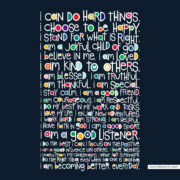 I would love to purchase this someday and hang it in our home! I tried to order your Isaiah 9:6 print, but the links no longer work. I know you’ve been inundated with questions, but I have just one more. I love love love this print and ordered it last year as part of a “bundle” with the house, etc. even though I only wanted the print. 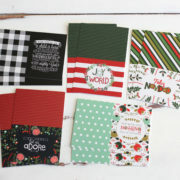 I want to say the one with the bundle was 11×14 or something along those lines. I printed mine (at costco, just as a matte photo) and mounted it on some card stock to fill my 16×20 frame. Can I use my 11×14 download to print the larger size or do I need to re-purchase to get the 16×20? Thanks for your work on this. It really is spectacular! Are you still selling this print in the biggest size? That link doesn’t work anymore. 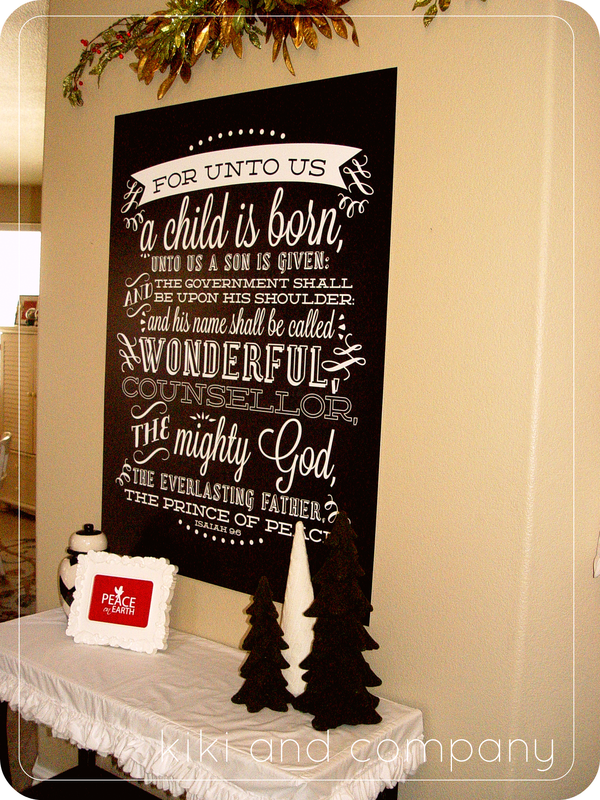 Love your Christmas Bible verse posters! I’m glad I found your site. I will definitely want to order some posters, not just for Christmas, but all year round. Thanks for sharing!